NC State Veterinary Hospital dentistry clinicians improvised a technique they — and possibly no one else — had ever used before. The term “beakistry” sounds like it could be one of the dark arts worthy of inclusion in a novel by Stephen King, the master of the horror genre, but it isn’t. It’s a term to describe a form of dentistry applied to animals with beaks, like birds and turtles. Now, don’t call any lawyers, because we’re not sullying the good name of any best-selling authors. Stephen King is the name given to a yellow-bellied slider turtle rescued from a pier at Falls Lake in Wake Forest after he was severely injured by a fisherman’s hook. Stephen King’s beak was damaged by a fishhook. It appears that the turtle was caught by someone fishing from the pier. 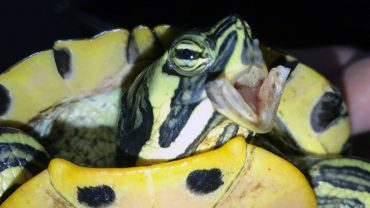 While attempting to remove the fishhook from the turtle’s mouth, its beak was horribly injured. Fortunately, this turtle was noticed by good samaritan Loren Tatum, a former member of the NC State College of Veterinary Medicine’s Turtle Rescue Team and a veterinary technician. Tatum took the turtle to a local veterinarian, the hook still embedded in its mouth. The injury was so severe the case was referred to NC State. Graduate student Mandy Womble took the call and handled the intake for the injured turtle. “At first I didn’t understand why they couldn’t treat the turtle locally — until I saw how bad it really was,” she says. The Turtle Rescue Team is headed up by Greg Lewbart, professor of aquatic animal medicine. The team is a volunteer organization run by veterinary students who provide medical, surgical and husbandry services free of charge in the hope of releasing rehabilitated turtles back into the wild. The Turtle Rescue Team sees and treats over 500 wild turtles, reptiles and amphibians each year. 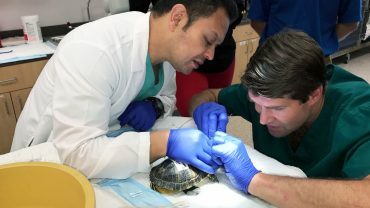 Students have the opportunity to not only refine their medical skills on exotic species like turtles, but they also help protect North Carolina’s native wildlife. Student volunteers take turns accepting patients into the program, and all the turtles who come under the care of the team, get names. This year, they are using the names of celebrities, which is how Stephen King the turtle got his name. Lewbart says that he had never seen an injury quite like the one suffered by Stephen King. “It was out of my wheelhouse,” he noted. But as luck would have it, just this summer the CVM has added two board-certified veterinary dentists to its team of clinicians and Lewbart thought they may be able to help in this particular case. Curtis Stiles, clinical assistant professor of dentistry and oral surgery, and Lenin Arturo Villamizar-Martinez, assistant professor of dentistry and oral surgery, were eager to be of service. They operated on Stephen King for more than an hour, with help from registered veterinary technician Jeannie Losey. Lenin Villamizar-Martinez, assistant professor of dentistry and oral surgery, left and Curtis Stiles, clinical assistant professor of dentistry and oral surgery, right. He points out that the case met three principles he and Stiles use in treating veterinary dental cases — that after treatment the animal is able to socialize, eat by itself and is not in pain and can enjoy a good quality of life. Stephen King met all three. Reptiles and amphibians are slow healers, Lewbart says, so the brace will be in place for about three months. Although it won’t be able to eat normally, its mouth is left slightly open so it can breath in case its nose is somehow obstructed. In the meantime it will be fed and kept hydrated through a feeding tube inserted by Womble — “the first one I’ve ever done” she says. The turtle will be kept in its own tank in the Turtle Rescue Team quarters until it is fully healed and ready to be released back in the wild at Falls Lake. Although it was an unusual case and the injury was especially bad, Lewbart says he is very optimistic that Stephen King will fully recover and return his old haunts (sorry, couldn’t resist that). 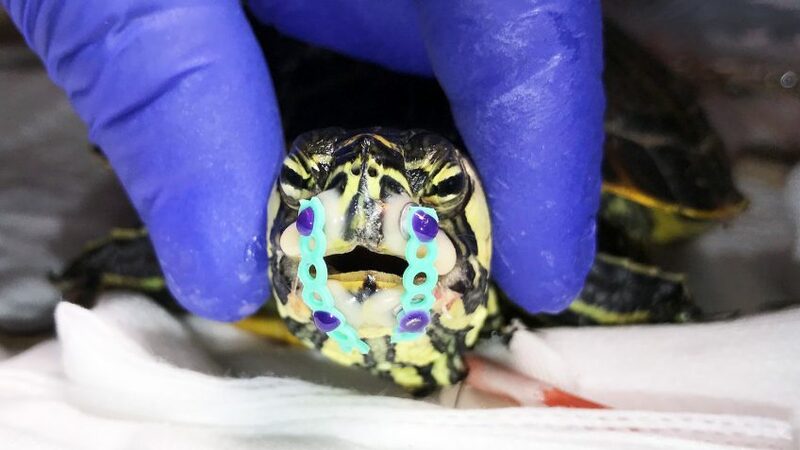 With resources like the Turtle Rescue Team and a fully staffed clinical dentistry service, the CVM is prepared to handle unusual and difficult cases of all kinds for individual clients and referring veterinarians. Even cases that require beakistry.